A bit like being in a cave (sprayed with some concrete artexy stuff inside). But nice enough and we stayed for another. Regarding the food I agree with the last 3 lines of Lettonie's comment 18/08/09, but didn't find it unfriendly. The food was rubbish. Ploughmans with tiny bits of cheese and thin sliced white bread! The chicken burrito was microwaved rubbery and soggy. The ham and leek pie was tiny, about 4" x 2" and also soggy pastry as that too had been microwaved. When will people learn you don't microwave this kind of food! - Also, the white wine was warm. A total waste of money, and as a bar, they have the audacity to add 10% service charge! I too would say...Avoid.... unless you are desaparate for a drink and want to see the river through windows that need cleaning. 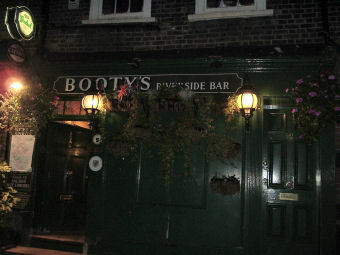 This has to be the unfriendliest pub I've ever visited since coming to London - which is saying something. The staff barely look up as you walk in, eventually serve you in a bored, contemptuous fashion, and generally make you feel uncomfortable if you are not a regular. They had some Sunday papers next to the bar, clearly out on display - I went to get one, and a large man working there, who I think was the manager, actually grabbed it back and told me that they were his, and he was about to take them away (? - at 4pm in the afternoon?) The tables are decked with sad wilting bunches of carnations, the food is microwaved rubbish (had a rubbery tasteless chicken burrito here about a year ago) and the toilets less than clean. A real shame, as it's got bags of character and could be something special in the right hands. We couldn't wait to leave! Avoid.